I am visiting Amish communities in northern Indiana this week. Yesterday I was in Adams County for a little while. I needed a pie for a dinner later in the evening in Lagrange County, and so embarked on a bakery expedition. I first stopped by R & E Sales, which you might remember from a post on marketing with Amish recipes. 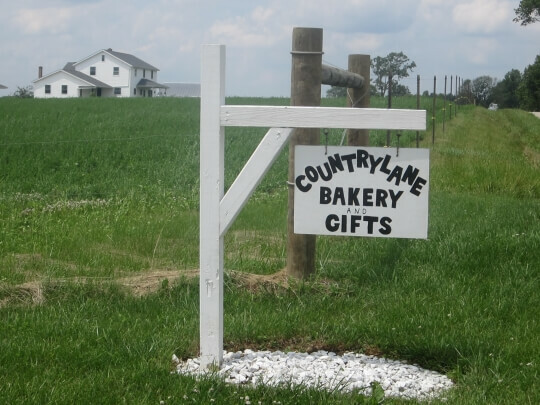 The lady at R & E, after admitting the only pies she had were a few days old, helpfully pointed me to Countrylane Bakery, about a 15-minute drive away. She also made sure I had a community map/business brochure to take along. Adams County is not like Lancaster County, with retail stands and shops at seemingly every other household. Construction businesses are more common here, though you will see a decent share of signs for places you can stop (produce stands, the occasional dry goods store, etc) if you drive around long enough. To my surprise, I had visited this business before, when it was just a fabric shop. The bakery side of the business had been up and running for about six months, and competed for floor space with rolls of fabric and other items. 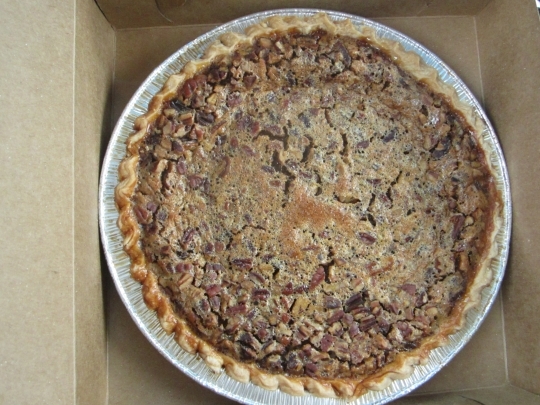 Countrylane had exactly two pies in stock when I arrived, among its cookies, cinnamon rolls and fry pies–a pecan pie, and to my surprise, a shoofly. I asked the lady who eventually arrived after at the counter from the house (this is a small shop, so people aren’t always at hand) what was going on here, since shoofly is really a Lancaster County thing. 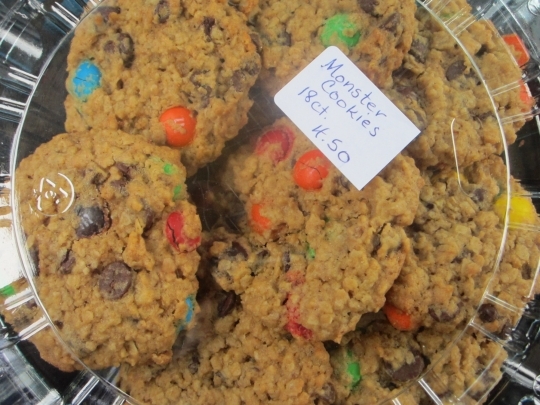 I also picked up some Monster cookies. Monster cookies can never wait to escape their package. It’s a small shop, but if you’re there at the right time, you should find some nice baked goods. You can also check out the selection of fabrics and other items they sell. Today I’ll be in Allen County and then back to Lagrange. I don’t know if I’ll make it to the Topeka 4th of July buggy races, but it’s a possibility. Those will follow a town parade this evening at 6:15, or whenever the parade gets finished. Enjoy, and travel safely, Erik! Happy Birthday, America! What a coincidence. I had made two pecan pies for a Fathers Day fish fry which was canceled at the last minute due to illness so I froze one and ate one 🙂 We decided to have the fish fry today so I am thawing the pie. Wish I could travel around this summer and stay with the Amish. I envy you. Have a safe and fun trip. Could you post some more large scale photos, like what the whole of the bakery and fabric shop looked like? Assuming that the owners are ok with that, of course….We have a new Amish settlement in my area and I’ve finally gotten to visit some of the businesses, so I’d love to see some others. Both the pie and the cookies look awesome. Maybe later we can see pictures of the store inside too. I would gladly pay that price for Monster Cookies because it seems cheap to me. It’s been a while since I baked a monster-size batch of those. The pie and cookies look totally delicious…..too far away to drive tho….. I did pick up some goodies at an Amish Bakery across the road from JR’S GENERAL STORE about 5 miles south of Bainbridge off U.S. 50….and I was so disappointed with all but one item….. I purchased a cinnamon roll which was so dry I could not eat it….an apple fritter that was not any good either, a morning glory muffin that was not even close to being called a morning glory muffin…..had way too much carrot in it, and a fried peach pie which the pie was ok, I did eat all of it, but the rest I did not eat….the name of the bakery was the Country Crust….so you may want to think twice before you buy these items there…..they may have different Amish baking for them…..so I will not be buying these items anymore there…. Who can bake and sell a pecan pie for $7? They must have their own nut trees! And the price on the monster cookies is incredible. The urban bakery where I work sells cookies for $2.25 EACH. On Wednesday I was looking at Pecan pies while shopping for supplies for the 4th of July and the going price in my area is $7.0 for the 9 inch size. The “premium” deeper dish, in the 11 to 12″ sizes ran from $10.0 to $12.0. Made me think that they must price them at a dollar an inch in diameter! Prices seemed typical to me. Then again pecan trees are very plentiful where I live and last year was a bumper crop. BTW: It was the calories that stopped me, not the price of the pie. That is why I was only “looking” at them, not “buying” them. 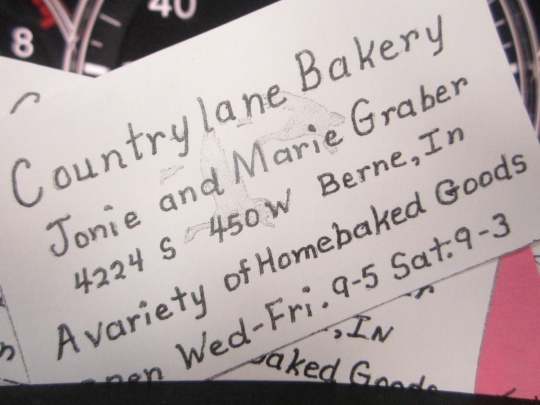 I too would like to have seen pictures of the Country Lane Bakery. No Amish photos, just the bakery. Enjoyed your photos. And Erik, I always enjoy your stories of your travels. Thank You and have a safe trip. That pie looked delicious as well as the cookies. I just wanted to take one from the plate. YUMMMM!!! Erik, hope you had a great visit and that the parade was wonderful. Who won the buggy races? I was at a cookout so did not get to the races though I arrived in Topeka in time to see some fireworks. Also, a fire in a house on main st at the same time fireworks were happening. So, there was a lot going on. Right now I am somewhere in Nappanee settlement on an Amish business tour with a friend, posting this using my kindle. There are some big Amish companies here providing an alternative to factory work. The RV factories by the way were described to me as “booming”again. I agree with Magdalena—the price of nuts (especially pecans) being what it is today, they must have a very cheap source to price pecan pie that low! Oh, those cookies look good (sorry for the drool…)! I enjoy your photos, Erik…it’s always fun to get an idea of what you’re experiencing on your “road trips” amongst the Amish. I tried calling my cousin at Kountry Wood Products today, and was told he went out to lunch with Erik. That is FUNNY! Small world isn’t it? It’s in Pa. We are leaving this morning, stopping in Somerset county, and visiting graves of ancestors. Then on to Lancaster county for the reunion. Friday we want to check what is in Lancaster county. If anybody has any ideas let me know. You forgot to mention, Erik, that you were also in Belle Center, Ohio. Stayed the night at Mark’s. And had lunch with Mark and I. Fritzi was quite put out that you didn’t come to visit him, as well. He thinks everybody should. Don I did not forget, that was a nice lunch we had. I am sure Fritzi was at least pleased to know we talked about him over lunch! There is a bakery north of berne on us highway 27 next to D.L. Schwartz blacksmith shop. They sell some fantastic fruit pies loaded with fruit, not just perma flow. Not only are the pies delicious, they are also very fancy with braided crust borders and incised decorations on top. Can we order the pies or cookies in the mail.